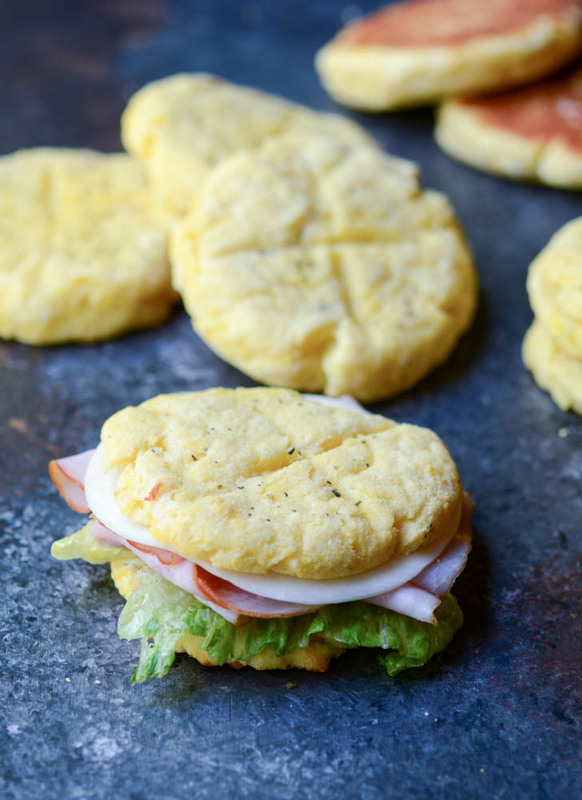 These low carb, Fat Head Keto Rolls are almond flour free and the perfect alternative to traditional buns for sandwiches, burgers or even personal pizzas! If you’ve never tried the Fathead dough it’s for a fabulous pizza dough. 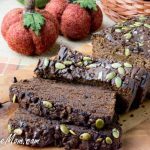 I changed the orginial recipe removing the typical almond flour since we have nut allergies in our family. 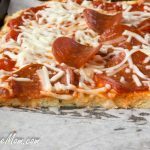 I’ve used the dough for savory pizza, pizza pockets, cheeseburger calzone, chicken calzone and even for sweet recipes like a cheesy danish and pumpkin twists! So this recipe is essentially just my pizza dough recipe with 1 addition and a change in how to make the rolls. Pretty simple and picky family approved! I took this on our Cross Country trip making them ahead of time and freezing them. We enjoyed them as sandwiches and for burgers as well as just a roll with butter on the side of an entree. If you do freeze them as I needed to do for our trip, I baked them, sliced them after they cooled and froze separately first on a baking sheet so they wouldn’t stick together. Then placed them in a ziploc bag. To reheat from freezer I just toasted them, worked wonderfully. You can also store these in the fridge and just reheat in a toaster oven. If you store in the freezer, bake, cool, slice and freeze on a baking pan separately then add to a ziploc bag so this way they won’t stick together. I’ve reheated straight from the freezer. This video below is showing how the dough comes together. Instead of spreading it out on a baking pan, simple form 8 round mounds of dough and flatten slightly or keep smaller and don’t flatten and they will be higher. UPDATE: I mistakenly added 1 tbsp of baking powder instead of 1 tsp when my kids were talking to me one afternoon while preparing this rolls again. GOOD THING IT HAPPENED! LOOK AT THE DIFFERENCE IN HEIGHT! *So if you want fluffy rolls with dinner use 1 tbsp and if you want flat rolls for sandwiches use 1 tsp of baking powder! Update: After making these numerous times over the last year, the rolls were just too big in my onion. I reduced the size and got 12 perfect rolls. Nutrition is adjusted for 12 now instead of 8 rolls. In a microwaveable bowl add the mozzarella cheese and cream cheese. Whisk flour, baking powder and dried seasonings together. Add the eggs to the dried seasonings and stir until combined. Add this to the cheese mixture and continue to stir until incorporated. Wet hands and separate dough and form 12 rolls. If desired flatten slightly or keep smaller and less wide as my pictures show. Place them onto the baking sheet and bake for 15 minutes. Cool then slice in half. Enjoy immediately or refrigerate or freeze. See notes above video for freezing. *Please note, I do not use the baking powder in the recipe for the pizza. 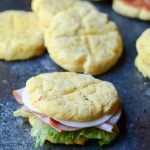 ***If you want fluffy rolls with dinner use 1 tbsp and if you want flat rolls for sandwiches use 1 tsp of baking powder! Thats a lot of coconut flour, with no liquid, are they hard? coconut flour is very fibourous. That is why my husband loves them. I just made these and they are great! First stab at bread/rolls on this Keto journey! Thanks so much! The flavor was great, however, the center was not cooked in 15 minute. Renamed for another 8 min. but not done. Is the center supposed to stay somewhat raw? The tops got too browned. In my experience with low carb baking, the centers will never feel done when they are hot from the oven. But as they cool, all that fiber will soak up the steam and they will be chewy and moist-crumbed. If they aren’t, you can try cutting them in half and toasting to remove some of that extra moisture; or making a new batch and dropping the oven temp by 25 degrees and upping the cooking time. I think that was probably the cheese in the recipe. The center may have looked like it wasn’t cooked but as it cools and dries the moisture you see is the cheese that’s mixed in the recipe to make the dough. So the 15 minutes should really be enough to cook them through and once cooled they are fully cooked. 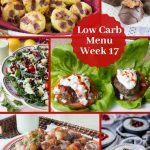 Thanks for providing some nut free options for low carb recipes! My pleasure! My youngest has a tree nut allergy so I need to. But he often hates the taste of coconut so it’s challenging to disguise, but in this recipe he doesn’t notice! I hate it as well, glad to hear it isn’t noticeable in this. I tried adding some coconut flour to a cream cheese pancake which I felt was lacking something but all I could taste was the coconut flour and hated it. Think I’ll just try a couple then see how it goes,the coconut flour I have is a little high in carbs in large amounts so don’t use it often but now I have it I want to use it. I didn’t realize the recipe called for 4 cups of mozzarella until I started the prep – so mine endedup half cheddar and half mozzarella. They came out awesome! The cheese separating may have been due to it being heated for too long. I had to really work my the cheese into the flour as it melted too much at 2 min. If you have a Stand Mixer with a mixing paddle, use that. Allow it to mix for 5-10 min. It will be nicely mixed into a smooth dough. Curious regarding nutrition…270 calories each or for 8 servings? I only have two cups of mozzarella cheese. Will halving the recipe as you have it printed work? do you have to use full fat cream cheese? Can i substitute almond flour for the coconut flour? No they can not be subbed. Brenda, while your son is allergic to nuts, I’m deathly allergic to coconut. Is the version of this dough that DOES use almond flour still available? No I never made an almond flour version. You might have to Google another site for an another flour version as so many recipes use it I’m sure it won’t be hard to find. So the calories are higher than regular bread. Can you tell me the benefit of these over regular bread besides the gluten? I’m trying to lose weight. Erin, this is because of the higher fat content, and keto is a high fat, low carb, moderate protein diet. Go keto and lose weight, believe me, nothing else has worked for me. At first it will seem like you’re going to Hades because of all the yummy fat… until you notice the weight starting to come off, then you will embrace it wholeheartedly 😉 Of course you still have to count calories when you want to lose weight but increasing your good fats do two very important things for those who want to lose weight – 1) it curbs appetite and 2) it knocks out sweet cravings within days. There are other health benefits to increasing your good fats. Do a bit of research amongst the people who know what they are talking about, of which there are many. Good luck! In the future when all the earth is cleansed of everything bad and brought to perfection .I will eat bread again in it’s perfect state and my perfect body will work how it’s supposed to until then. KETO /LOW CARB is as close as I can get I enjoy it . Hi Brenda. I don’t have a microwave, would melting the cheese on the stove work? 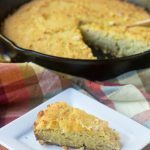 I’m familiar with the almond flour fathead recipe and have used it successfully. 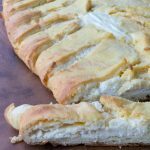 THIS recipe is by FAR the best tasting keto bread-y thing I have tasted. Delicious in anyone’s book, keto or not. 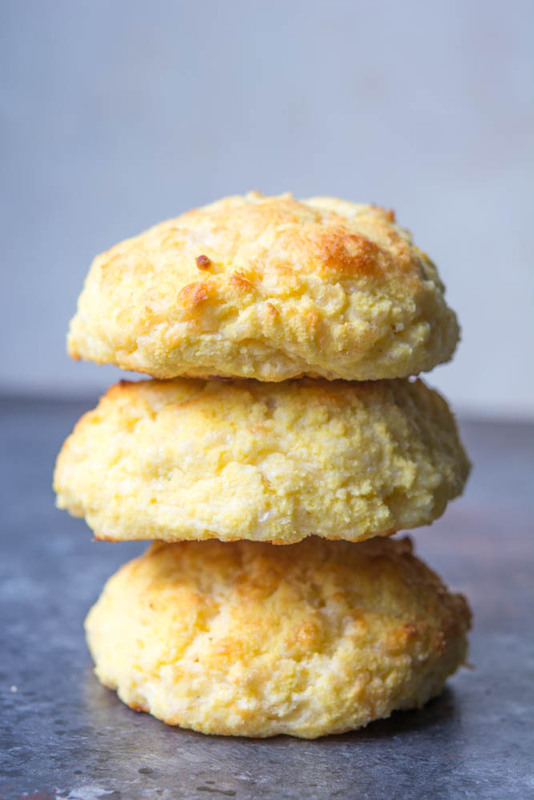 And that includes keto biscuits / scones. Better warm, as with all non-wheat substitutes, but soooo good! The ratio of cream cheese to Mozzarella is higher in this recipe and I think it makes the difference. That, and the fact that coconut flour gives a lighter product over almond meal. Yes, when you slice the rolls horizontally while hot the centres will appear a little undercooked but within half a minute it firms up and looks the way a quick bread should. Don’t be tempted to overbake. This will definitely be my go-to for everything that can possibly be made with fathead including breadsticks. Thank you for such a wonderful comment, made my night! They keep well. If baking the day before, just store on counter in an airtight container. For longer storage I’d place in the fridge. 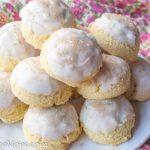 Can I use this recipe to make empanadas or is this better made as bread/biscuit only? If you want to make a keto empenada I’d try this dough. it is 100% perfect in an empenada, flaky and just perfect. Do you have to cut in half before refrigerating? 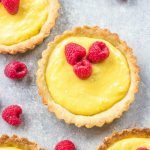 I found this recipe a couple of days ago and wanted to try it right away, as I am fed up with the sweet and sickly taste of almond flour. It literally makes my teeth stand on edge! However I did not have any cream cheese so I substituted the cream cheese for homemade Greek yoghurt. I also did not have onion or garlic powder so I used onion flakes and garlic granules, parsley, oregano herbs They turned out really good, so the next day I made them again but used more baking powder, they were equally as nice. Today I have made them again with the cream cheese and mozzarella but melted on the stove top as I do not have a microwave oven. I added some cooked chopped bacon along with the herbs etc, they are in the oven now as I type they are smelling delicious! I used a couple of the ones I made last night with a Butter Chicken Curry yummy!! Willlet you know how well they turn out! They turned out really well. My husband liked them, they are very filling so 1 was enough so it is very good for watching your weight! Thanks for sharing you substitutions. Hi, my rolls turned into pizza! what went wrong? It did taste fab, so fed up with eggy, coconut ‘bread’. Wow! These turned out AMAZING! I used a Mexican cheese blend from Walmart/Great Value because it was all I had on hand. I used 1 TBSP baking powder. Since it took me awhile to mix dry ingredients and eggs, I reheated the cheese mixture another 30 seconds to it would be more gooey before adding the dry ingredients. These turned out to be BY FAR, the very best Keto bread I’ve tried. I went Keto for a year and lost a lot of weight, as soon as I added back carbs and tried to “maintain” my weight, I gained a ton back over the next year. I am now back on Keto, and thanks to finally having an awesome bread, I think I can stick to it this time for good! Now if only I could find a cookie or sweet muffin with the same great fluffy, non-gritty texture, I will be all set when I am tempted. THANK YOU!!! Hey there! Just made my first batch and they are yummy! I logged it in MyFitnessPal, and it says there are 28 carbs (not 6.5) and 397 calories (not 270).per serving. Any idea what’s causing the huge discrepancy? 90 % of internet low carb recipes are flat out wrong. Don’t know if they are just ignorant and can’t take the time to do the math, or whether it’s bait to attract more traffic to their site. I just did a quick calculation in my head and came up with about 52 net carbs for the recipe, or about 6+ net carbs per roll. Cream cheese has 2 carbs per oz, Mozzarella cheese has 1 carb per oz. For these 2 items there are 24 carbs. Where does anyone find a cup of coconut flour having 119g? Virtually all reputable brands have 24 net carbs per cup. So these three items have 48 net carbs. All the herbs combined have about 2 carbs. Baking powder has 1 carb. 4 eggs, or about 200g, has about 1.5 carbs. This is approximately 52.5 net carbs. Divided by 8 rolls is 6.56 net carbs, not FOUR! Today I saw a “baking blend” recipe that stated ONE net carb per cup. It was four equal (1/4 cup) parts of almond flour, coconut flour, flax seed meal, and oat fiber, which is 10 net carbs, not ONE. How do these people think they’re helping anyone if they can’t bother to do the math? I measured my coconut flour and it was 119grams. If people overfill their cup they will get a drier roll than someone who weighs it. I just switched to a new recipe plug in with more accurate nutrition info and it adjusted the carbs. I also adjusted the size of the rolls as they were too large for a serving. It’s now 12 rolls instead of 8 which is a better size in my opinion. Rather than accuse someone of trying to bait someone to my website, a simple, “Hey you better look over your nutrition i think there may be a mistake” would be much more appreciated, especially since I am constantly putting out free content of recipes I make for myself and family. Myfitnesspal is highly inaccurate for all low carb/keto measurements. I just made these, I halved the recipe because I didn’t have enough eggs but they are fantastic!! I just had to tell you!! These were Ahhhhmazing! I was hesitant to try these since I usually do not like foods baked with coconut flour, but I am trying to cut back how much almonds I consume in a day, so I decided to give these a try. I am so glad I did! You cannot even taste the coconut flour. I used the 1 tablespoon and got beautiful raised rolls. After reading the reviews of the cheese mixture being difficult to mix, I chose to throw it Into my kitchenaid mixer and mixed until each portion was just combined. They came out perfectly “bread” like and had no moist or soggy middle and we’re very easy to work with. Thank you for the great recipe! If I made them for tomorrow, how do you suggest reheating? They require refrigeration? We sliced them in half and toasted them. Yes we keep them in the fridge then slice and toast. This is by far the best bread/roll recipe I have tried. Thank you so much! Just made this but replaced the coconut flour with almond flour. Soooo good! Made 8 large rolls. 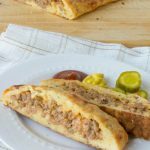 We used them as hamburger rolls and they were absolutely perfect. Flavor is amazing. So you used the same amount of almond? Followed the recipe, browned on the bottom but not cooked in the middle. So dense that if I threw it at my husband I could have caused a concussion! Passing on this one in the future! Did you actually weight the amount of coconut flour you used? I did not watch the video…so when I was trying to incorporate the cheese,flour,egg mixture together with a spoon I was getting really upset. So I actually threw the spoon into the sink and started using my hands. While rolls were in the oven I watched the video and had to laugh when I came to the part where you said to dump the spoon and use your hands.I live alone so it will take me awhile to eat all the rolls…but will definately make again. Brenda , I appreciate that you give weights in your recipes, but I’m curious, when the weight given doesn’t agree with the cups which is the one you use. For instance pretty much every cheese uses 2 cups per 8 oz which would 454 grams of mozzarella here…is the 409 correct for this recipe? Also, I found the tops getting overly brown at about the 10 min mark and done at about 13. i just pulled them out and I’ll know more about the inside in a minute. I was after a dinner roll here so I made 10 and they are still huge 🙂 I think 12 would still be a large dinner roll and cut the carbs as well. I calculated mine to still be 4.1 nc even making 10. I’d be interested to know what cheese and flour you use. After adding up my specific brand ingredients (followed the recipe exactly) I found each roll to have 20 carbs. I’ve gone back over the list twice and still get 20 carbs. The cheese and the 1 cup of coconut flour are the big culprits and the spices add a few too. Can’t figure out how you came up with 6g per roll. These were amazing!!!!! I liked the coconut flour version better than the almond flour. I want to make these for my “Thanksgiving Rolls” With those spices, do they end up tasking too italian? If that makes any sense. Any recommendation of other spices to add or leave out? You can skip the basil, oregano and parsley and just keep the onion powder and garlic powder. If you want to make it a bit sweet, you could add cinnamon, all spice and a sweetener of choice. FYI : Almonds are SEEDS, not nuts. They are Drupes, just like coconuts. It is entirely possible that your nut-allergic family member would hve no problem consuming almonds as well as other seeds. My son has been tested multiple times by our food allergist and is definitely allergic to almonds, peanuts, cashews, hazelnuts, walnuts, pistachios, macadamias, pecans, pine nuts, Brazil nuts, acorns, and chestnuts. 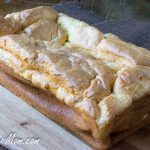 Have you ever made this in a bread loaf pan or something like a 9×13 baking dish? Love this recipe! If you make ahead and either keep refrigerated or frozen, how long do you think they would last? We went on vacation with them and they lasted in the fridge for two weeks. Or put them in the freezer and take out to thaw when you want them, good for at least a month frozen. I don’t know for sure but if you try it please let me know! Big disappointment. I was worried about all that coconut flour which usually means DRY, and yes, that’s what these are. So dry that they scratch your throat swallowing them. Since I don’t have a problem with nut flour, I’ll make the almond flour version next time. I just made these, and my husband and I just tried them. My husband says they have a cheesy texture, but not a cheesy taste. I got a “sense” of coconut, but not a coconut taste. They weren’t too moist or dry, and we really enjoyed the flavor. I was a little worried when I was mixing them (by hand) that the flour mixture and the cheese weren’t fully incorporated into each other, but they came out great. 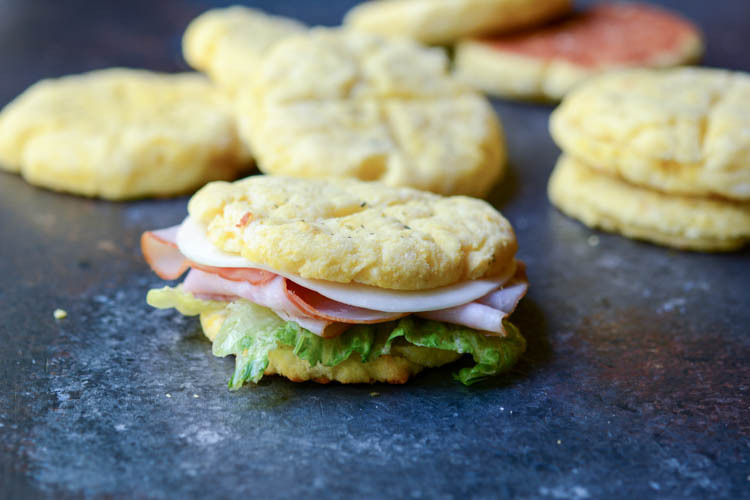 We’re excited to try them with hamburger patties, since we are on low carb/high protein. I made this recipe for the first time. They were good. Next time I will add more cheese though just for my personal love of cheese. However, I have question…. I followed your recipe to the letter and they didn’t rise at all.. come out like flat pancakes. It was a brand new container of baking powder. Any suggestions??? I just took them out of oven , going to slice them for hamburgers today . Yum! Just wondering if you could add butter or substitute butter from some of the cream cheese or an egg to make them more flavorful and flaky. The cream cheese acts like binder though to hold the cheese dough together, I don’t think butter would do the same thing. After making the dough, can I skip the baking part & just refrigerate it to be baked at a later time? If so, do you know how long it will keep in the refrigerator & the best way to store it? I may have missed it in all the comments, but is it okay to freeze uncooked fat head dough? I haven’t tried it but I think you should be able to freeze then thaw before you need it. Thank you for this recipe. I will give it a try. To give more fluff to the bread, have you tried with beatten egg white ? Instead of adding more baking powder.. I see you refigured the nutrition for 12 rolls but the instructions (No. 9) still say to shape 8. I’m trying these tomorrow. Thank you for letting me know. Yes I felt the 8 rolls were a little too big and 12 makes for a better size. I’ll adjust that now, thanks again. Why does it come up as 17 carbs not 4 like you say using your recipe.